The Natural History Museum in London is embarking on an epic journey to digitise 80 million specimens from one of the world’s most important natural history collections – documenting 4.5 billion years of life, the Earth and the solar system. Almost all animal, plant, mineral and fossil groups are represented. Digitising the Museum’s collection will give the global scientific community access to unrivalled historical, geographic and taxonomic specimen data gathered in the last 250 years. We are committed to open access, open science, and open data. Over the next five years we plan to digitise a quarter of the Museum’s specimens by establishing high-throughput digital capture workflows for all major collection types. 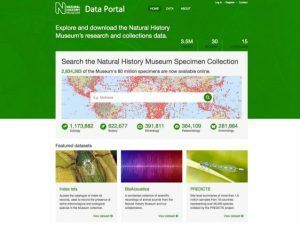 We have created an online Data Portal giving everyone in the world access to the specimen and lot-level data, and will develop flexible informatics and visualisation tools to analyse the data. In our workshop on Friday the 25th at 15:30, on the Side Stage in the main building, we will be introducing you to our Data Portal and our open APIs. We will describe some of the digitisation challenges we face, and our desire to make this not only an indispensable source of data for researchers & scientists world wide, but also a source of information and knowledge for the amateur, the student, and the curious. Do people collect specimens on nice days? What was the collector who collected from the most distinct localities? What can we learn about the collectors? Are most specimens collected in rural areas? On a stroll through national parks? Find out more about the Digital Collections Programme, and check out the Data Portal on GitHub. We invite you to take a closer look at our iCollections data in particular, but feel free to explore of course! At the moment the Data Portal is designed with fellow scientists in mind, but this information should be accessible for anyone, from school child to educator, from the curious to the amateur expert – from anywhere in the world. How can this data be visualised in more interesting ways? How can we make the interface more attractive to different audiences? What other queries can you think of? Using the Data Portal APIs – what creative applications can come out of this data-set? What other APIs would you be interested in seeing developed? How can this data truly go mobile? 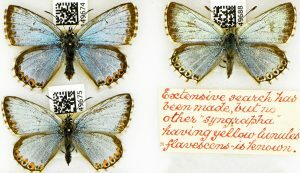 This session and Hackathon Challenge are supported by the EC-funded SYNTHESYS project, which encompasses a wide range of natural history collections across all of Europe.